MTH: You’re a busy person these days filming classes and managing your growing video channels. Do you have any special strategy for fitting 100 people into your daily schedule? LS: Yes, things are pretty hectic for me at the moment – I just finished filming my next course and I’m now trying to complete some other projects before heading to Europe at the end of the month for a 3-month trip! My daily practice is to spend an hour at the start of the day at my local cafe doing some work, sketching my coffee and a few people sitting at the other tables. This means it’s already part of my daily practice to sketch people, therefore, all I have to do is to allow a little more time for doing my 20 per day. Perhaps I just have to wake up 30-60 minutes earlier and it will then be easy. Or spend 30 minutes less time on Instagram and only get up 1/2 hour earlier. MTH: Any special goals for the week besides hitting 100? LS: I know from previous years that it’s pretty easy for me to hit the 20 per day goal if they are just simple ink drawings of mainly heads. I did a test a week ago and it only took me 15 minutes to do 20 really fast loose sketches. Therefore I need to make this more of a challenge! I want to aim for 100 watercolour people. Ideally, they’ll be painted on location, but if not, I want to add colour later that day when I’m home. I would also like to do a little more anatomy research during the week… but I’m not putting any pressure on myself for that. MTH: You’re a fast sketcher, but catching people on the go is hard :) How to you speed up? LS: My theory is that I have to sketch from knowledge. So I see someone and very quickly form an idea of how this person is different from the classic male or female person I have in my head. I try to capture the gesture and then draw the distinctive features of that specific person, finishing it off from my knowledge, if they move. LS: It depends a little on how much I captured – if it describes enough I leave it incomplete otherwise I finish from my knowledge as mentioned above. I might look for someone else to use a second model to help me finish – but while doing a challenge like this I want to keep drawing and not wait around for someone to turn up in a similar pose. MTH: Do you do the sketch with a single tool and embellish later with color etc – or do you work with a variety of tools all at once? LS: My preferred way of working is to capture gesture with my paintbrush first and perhaps some shadow shapes as well, and then draw over the top (into the wet) with my Lamy Joy (med nib and De Atramentis Document Ink) This means that I sometimes get unexpected black blooms of ink for a facial feature, but I can live with that! Whether this technique will be quick enough for the challenge is yet to be seen! MTH: This is one I get asked a lot: What do you think about the ‘social’ issues of drawing people in public. Do you twinge when you get caught – or is it even an issue for you? LS: I do feel a little awkward when the person notices me drawing them, but I normally just explain what I’m doing and show them my sketch. I haven’t gotten a bad response yet! During #OneWeek100People2019 I feel more confident to sketch anyone, as I have a good reason to be drawing people. I just tell them “ I’m trying to draw 100 people this week as part of an international challenge” and that gets even more positive responses. Anything ‘international’ sounds impressive to others. MTH: Related to that, have you ever had any unusually good or bad reactions? LS: As above, only good to date. 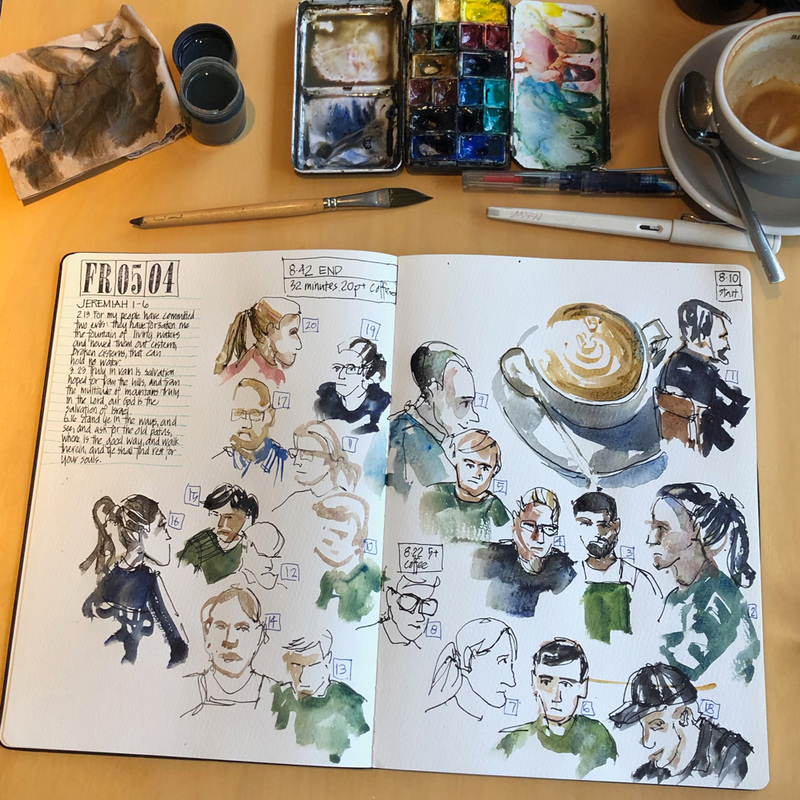 In fact, I’m definitely making many more friends at my local cafes these days now that I am sketching people as opposed to when I only painted my coffee cups. It really engages people and I get a total buzz out of talking with other when I’m out with my sketchbook. Sketching people gets the best reaction without a doubt. LS: Actually I have already fallen in love with people sketching (a lot has happened since we last sketched together hey?) although I’m still not super confident. I would just simply love to sketch more social gatherings with my family and friends. For some reason it feels more intimidating to sketch people closer to you, but I just have to do it. I suppose that I would love to be confident that I could produce beautiful work at a friend’s wedding. That would be special! Thanks Marc – its great to be doing this challenge again with you, Suhita and everyone else. ← Just a reminder: #OneWeek100People2019 starts April 8th! Thanks, Marc and Liz! As in past years, my situation has a bit of a personal challenge…I am pretty much confined to other’s schedules and depend upon my husband to get me places due to my disabilities. But I have figured ways around this scheduling problem. I spend some time in the car in parking lots at various stores and shops. I have become quite good at grabbing gesture sketches of people walking in and out….and I do sometimes combine several people in one sketch. Also, I do find myself in medical waiting rooms and get people sketching there. But here is where I do cheat on the 100 in a week thing…I give myself longer than a week and since I do not post them for the “official” challenge, I am ok with that. Also, I find sketching from the sports page of the newspaper a marvelous way to build my skill year-round….why the sports page? great actions shots! Thanks Liz and Marc for taking the time for this helpful interview! As a member of the public, it feels easier to accept someone sketching me than them taking my photo.